Photos of an elderly passenger crawling down the stairs of a Fiji Airways flight have gone viral causing outrage on social media. 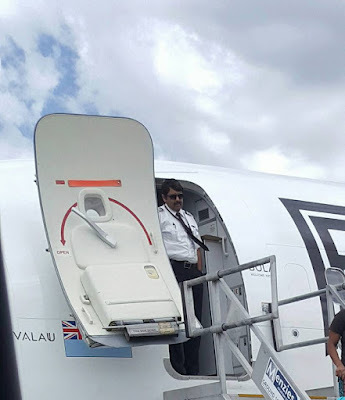 A passenger on board the Fiji Airways flight, Peter Tripp, took photos of the incident and posted it on Facebook. “Getting off my flight from Fiji. I was shocked to see how this Fijian lady was treated. “Ground staff just watched on as the crew tried to help her crawl and edge her way down each flight of stairs. “Hello ....there is a duty of care here and it is not the crews duty to do this. Old school days... once the door is opened the passengers are handed to ground staff. “There are legal consequences here and if she accidentally fell, the crew would have lost their jobs and the airline sued for damages. The Captain watches in disgust? “Passengers on transit bus was shocked and appalled. A disgusted passengers said 'OMG is this how they treat elderly passengers, ROLE THEM DOWN THE STAIRS'." “Not hyping this up.I said 'no they bring them down on a lift truck if they are wheel chairs passengers'." “I got up to say something to the ground staff and was quickly reminded by wifey I am OLD SCHOOL and I don't work for the airlines anymore. “Saying the least after the wheel chair passenger was wheeled onto the bus, wifey asked the Ground Controller if this passenger was a special requirement why was she not lowered down on a lift truck. “The controller said that the wheel chair passenger should have stated that she could not walk down the stairs. “I turned away in disgust. Did she think we were born yesterday. Wifey and I have 45 experience behind us in passenger travels and this is not the way we do things in Fiji Airways. “Let's stop contracting Sydney Airport ground duties and put an island touch back into the "THE WAY THE WORLD SHOULD BE." Fiji Airways managing director and CEO Andre Viljoen has responded saying “The comfort and safety of all our passengers is paramount”. “We are aware of the unfortunate situation that occurred at Sydney Airport," Mr Viljoen said. "We are unable to provide any further information surrounding this as we are unable to discuss individual customer matters." Incredibly disrespectful to expect any person of any gender or age, especially an elderly obese female, no disrespect, to have been treated this way! It's not rocket science, she needed assistance! Fiji army now going to do FIRCA Customs job will just compromise everything...these are the very same guys who were released from being hostages after hostage takers were paid USD 20m ransom by Muslim conservative nations. They surrendered cowardly without a fight against scarcely armed terrorists.. Philipine Army easily fought their way out and got coomendations from Israel army. Fiji army is now the joke in the UN. Yavu lamusona levu ga na vei moku kei vateratera tiko i Viti to their own unarmed citizens they are supposed defend. Just a clear reflection of their cassava patch dashing leader. Bunch of overpaid underpaid useless cowards who are being paid by us hardworking honest taxpayers to protect the thieving cowards they serve. Give us some arms and we will show you how to defend the nation and its people! very sad to see an elderly lady not given the proper treatment. 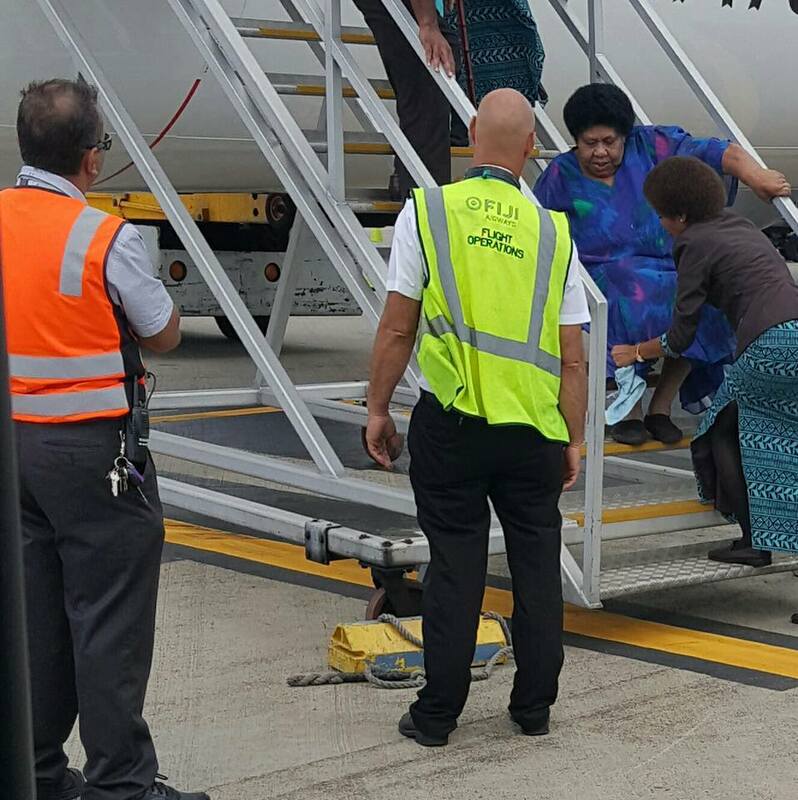 Fiji Airways should have assistance available for disabled or elderly travelers. The pathetically bystanding officials didn't even bother to help the elderly woman, what a shame. Looks like Fiji Airways has yet to learn how to be disabled-friendly.